Brett Kavanaugh before the Senate Judiciary Committee on Sept. 6. 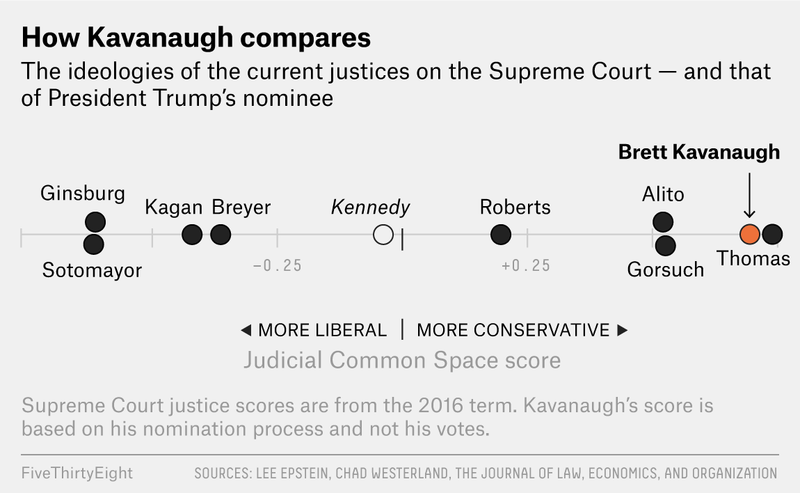 Since July, when President Trump announced his most recent nomination to the Supreme Court, FiveThirtyEight has been analyzing the effects of a potential Justice Kavanaugh — a potential that is now reality. Kavanaugh was confirmed on Saturday by a 50-48 vote in the Senate. Based on what we know about measuring the ideology of justices and judges, the Supreme Court will soon take a hard and quick turn to the right. It’s a new path that is likely to last for years. Chief Justice John Roberts, a George W. Bush appointee, will almost certainly become the new median justice, defining the court’s new ideological center. As measured by Judicial Common Space scores — which use the popular Martin-Quinn method for justices, based solely on their actual votes — the center of the court will be about as conservative as it was when Justice Sandra Day O’Connor, a Ronald Reagan appointee, was the median justice in the 1990s and early 2000s. According to these scores, the court’s center will now cross from mildly liberal to solidly conservative. This median position was famously occupied by the now-retired Justice Anthony Kennedy (for whom Kavanaugh clerked) for more than a decade. In it, Kennedy was widely known as the court’s “swing justice” — conservative on issues such as corporate campaign spending and the death penalty while also delivering narrow victories to liberals on issues such as gay rights, affirmative action and abortion. 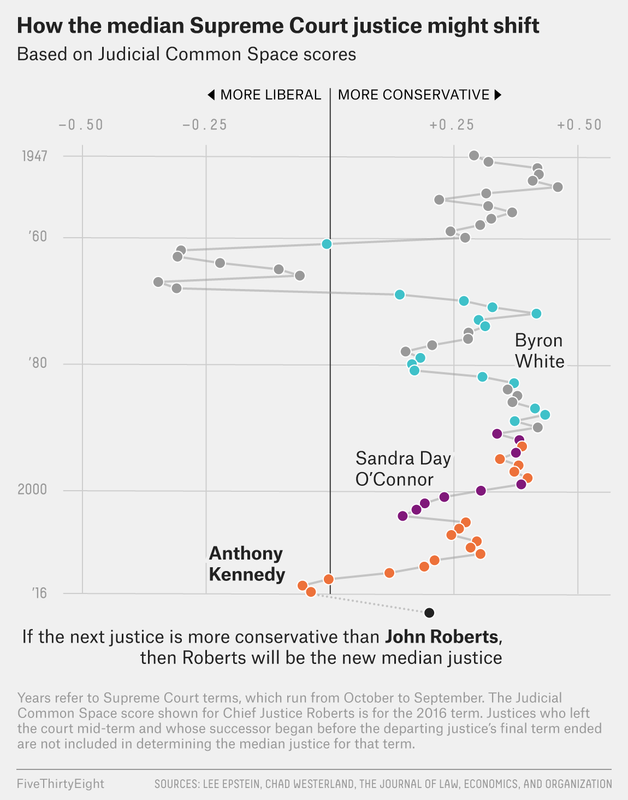 Roberts isn’t much of a moderate either, and by any quantitative measure, he’ll certainly be more conservative than Kennedy was. As the new “swing justice,” Roberts appears unlikely to swing very often — he has cast only five liberal swing votes since taking his seat on the court in 2005. But the new median-chief, it should be noted, is deeply concerned with the legitimacy of his Supreme Court — a legitimacy that could be at risk in the wake of the acutely partisan, at times angry, Kavanaugh confirmation process. (His nomination was surrounded by midterm implications and protest and was capped by a last-minute FBI investigation into accusations of sexual assault.) It is Roberts’s deep concern for the court’s reputation and standing that has often been cited to explain his majority opinion that saved Obamacare, for example. Wherever Kavanaugh ends up within the court’s ideological spectrum, he will quickly get to work. The court is currently working through a “quiet docket,” one that lacks the kinds of cases that would match the drama of the confirmation process. But larger issues will eventually bubble their way up through the judiciary — hypothetically, and most prominently, abortion rights and Roe v. Wade, the Affordable Care Act and maybe even a case related to special counsel Robert Mueller’s investigation in Russian interference in the 2016 election. How Kavanaugh’s conservatism and Roberts’s concern for the image of the court might interact remains to be seen. The laws of the land will be shaped by it. Ritchie King and Amelia Thomson-DeVeaux contributed to this article. Through the 2016 term, which ended in September 2017. “Close cases” are those decided by any five-justice majority, not exclusively 5-4 decisions.